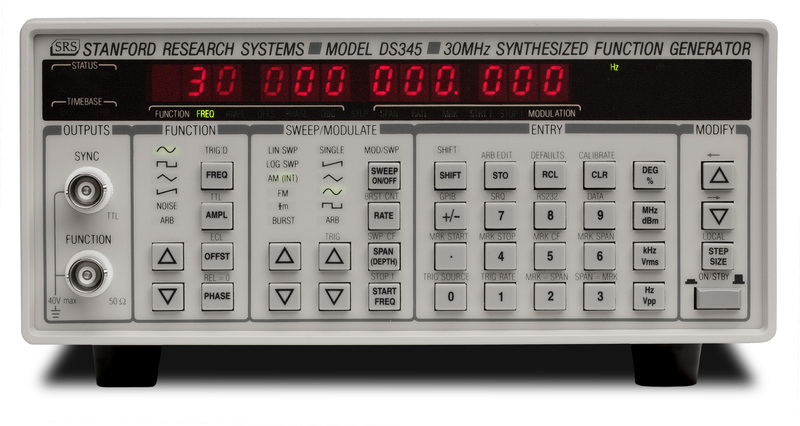 The DS345 Function Generator is a full-featured 30 MHz synthesized function generator that uses an innovative Direct Digital Synthesis (DDS) architecture. It generates many standard waveforms with excellent frequency resolution (1 µHz), and has versatile modulation capabilities including AM, FM, Burst, PM and frequency sweeps. It also generates arbitrary waveforms with a fast 40 Msample/s update rate. 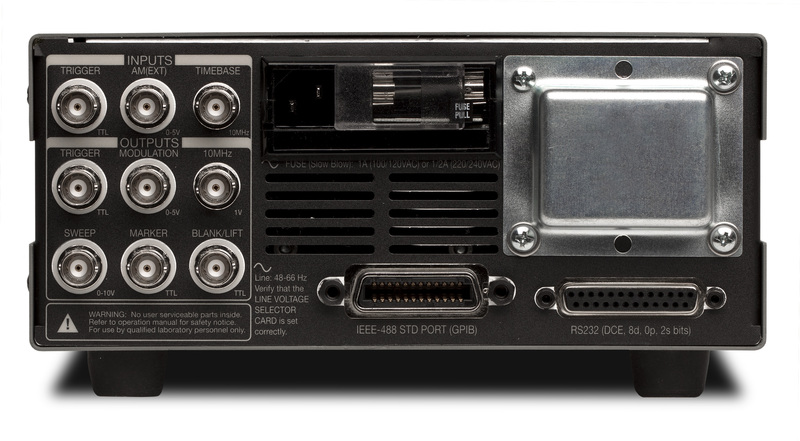 The DS345 generates sine waves and square waves at frequencies up to 30.2 MHz, and triangle and ramp waveforms up to 100 kHz. 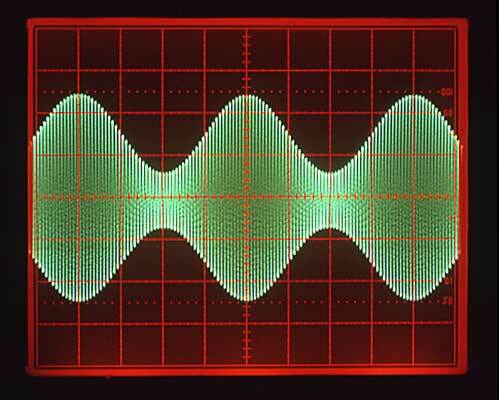 The frequency resolution for all functions is 1 µHz. In addition to the standard waveforms, the unit also provides a wideband (10 MHz) white noise source. The modulation generator can provide amplitude modulation (AM), frequency modulation (FM), and phase modulation (PM). When using AM, modulation depths of ±100 % can be selected with 1 % resolution. Negative values of modulation correspond to Double Sideband Suppressed Carrier (DSBSC) modulation. FM spans can be selected with 1 µHz resolution, and phase modulation can be set between 0° and 7200° with 0.001° resolution. In addition to the internal modulation generator, the output waveform can be amplitude modulated by an external signal applied to the rear-panel AM input. This input is always activeeven when other modulation types are turned on. 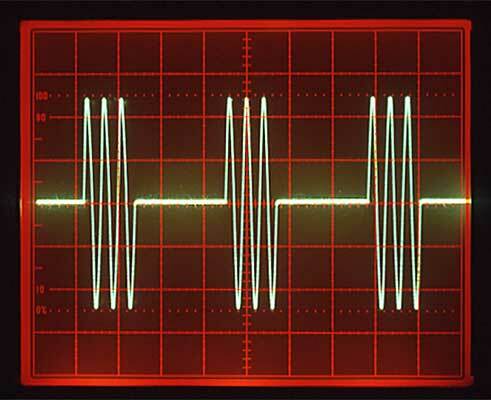 Since composing complex arbitrary waveforms at the keyboard can be a tedious task, Arbitrary Waveform Composer (AWC) software is provided at no charge. 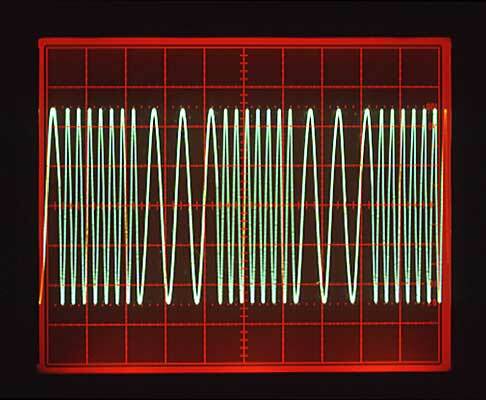 AWC is a menu-based program which lets you create and edit arbitrary waveforms on the screen, store them, and download them to the DS345. Click here for the latest version of the Windows AWC software. Grounding Output may float up to ±40 V (AC + DC) relative to earth ground. Interfaces Optional RS-232 (300 to 19.2 kbaud, DCE) and GPIB with DOS based arbitrary waveform software (AWC). All instrument functions are controllable over the interfaces.